There’s some pretty ambitious stuff being planned for East Carson, as you can see in this article from the Nevada Appeal. These plans are huge, and I’m not sure where all the money is going to come from, but if it all gets built out it’s going to create a whole new destination for Northern Nevada. It all revolves around “Destination Nevada”, a project proposed by RIDL, a local development company owned by the Hettrick family. Destination Nevada was hinted at back in September, but the full plans didn’t come out until just this week. The whole thing is built around the new train depot the V&T is planning for the east side of town, near where Highway 50 starts to climb up the hill to Mound House. But rather than just having the depot surrounded by a parking lot and sagebrush, RIDL is proposing a huge 150-acre development. There will be a central retail/office center, a quarter-mile across with underground parking. There will be a hotel/casino. There will be condos, shopping, restaurants, and a movie theater. The tracks for the new V&T will run through the development and end at a new depot on the site. And, at the south end of the parcel will be the Chinese Workers Museum of America. 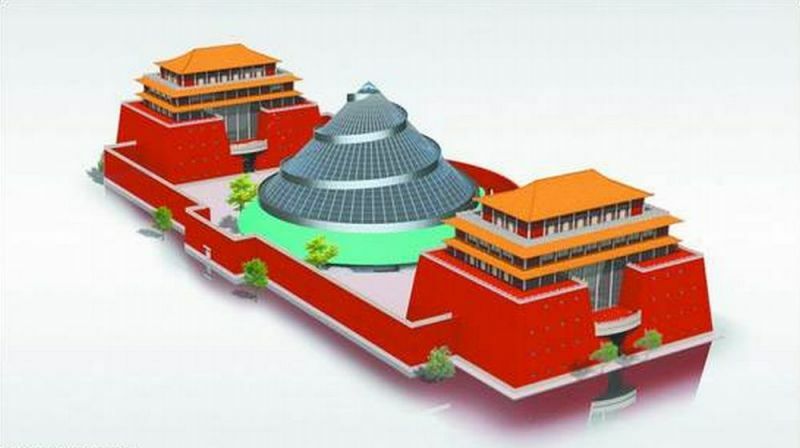 The Chinese Museum complex will be 250,000 square feet, with a huge central glass tower containing a permanent exhibit and two flanking pagodas with space for changing exhibits. The museum will be devoted to the history of Chinese immigrants who came to America in the 1800s looking for riches, but ended up doing menial labor like laundry and building railroads. Much of the original V&T was built by Chinese labor, and so not only would this museum tie in to the new rail line, it would also end up being a draw for Asian tourists to come to Carson City. At least that’s the plan. The whole development has been priced at about $900 million, and not much funding has been locked down yet. They’re thinking that investment money could come from China. RIDL also has some unnamed partners that could be chipping in for pieces of the development. But this seems like one of those ideas that looks really good on paper, but for which ground never gets broken. And if you look at the comments on the Appeal article, you’ll see that not everyone in Carson City loves the idea, calling it ugly, pointless and unrealistic. Plus there are the concerns that investors won’t be interested, and that our taxes will end up paying for the project, just like they’re worried that funding for the railroad won’t materialize. So I guess there’s not enough to go on yet other than a few drawings and a lot of talk. We’ll have to wait and see if something more comes out of it, or if Destination Nevada just collects dust on a shelf in the Planning Department.